The overlook from Pike Place Market offers one of the closest views of traffic traveling on the Alaskan Way Viaduct. Take those viaduct selfies while you can. 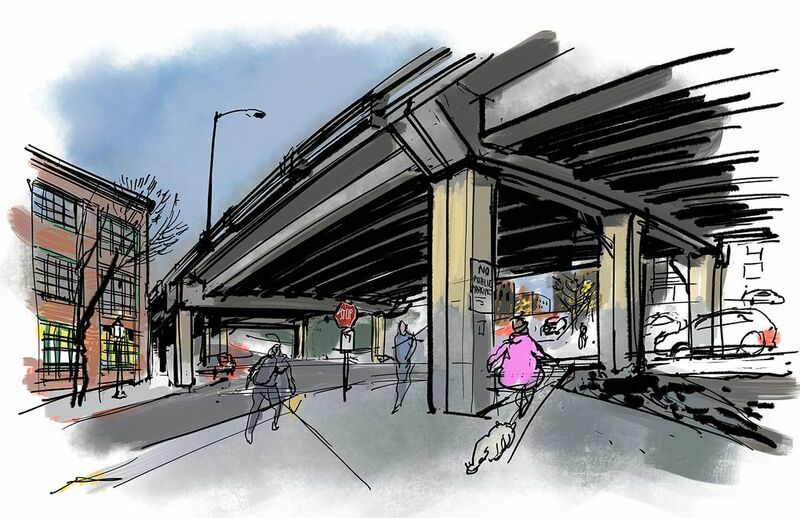 The aging elevated freeway is scheduled to close forever Jan. 11 to get ready for the wrecking ball. Many longtime Seattle residents are getting all teary-eyed and nostalgic about this moment. Sad emojis are flying on social media posts, never mind that a modern replacement tunnel is about to open. Isn’t anyone excited about the tunnel? I get it. 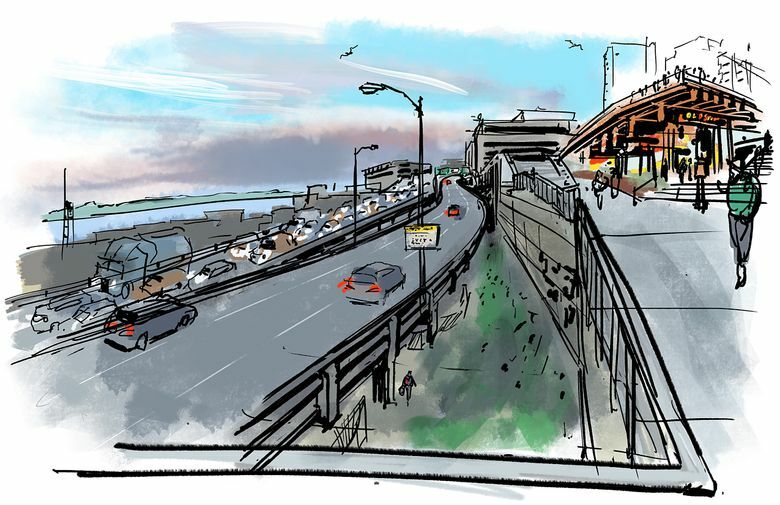 If you have not known the Seattle waterfront without the Alaskan Way Viaduct, which opened in 1953, a lifetime of memories may be associated with this 2-mile-long piece of Highway 99: your first ride on it as a teen after you got your driver’s license, or memorable trips with relatives, or an epic commute? Those who found themselves on it when it was damaged during the 6.8 quake in 2001 surely must have a story to tell. Others who see it every day from their downtown apartments or office windows may have also grown used to it. My relationship with the doomed freeway is a bit different, and not just because I’ve only lived here for 12 years. I rarely drove on it. My favorite memories include running on it during the Rock ‘n’ Roll Marathon last June, and sketching it time after time since its first sections began coming down in 2011. I’ve appreciated the many interesting viewpoints it offered, the sharp angles, gritty textures and light and dark contrasts. But no amount of visual stimulation could hide the viaduct’s ugly side. The drab spaces under its belly are nothing but a giant parking lot. Vulnerable pillars are held together with metal braces, and homeless tents set up under its cover have become part of the scenery. 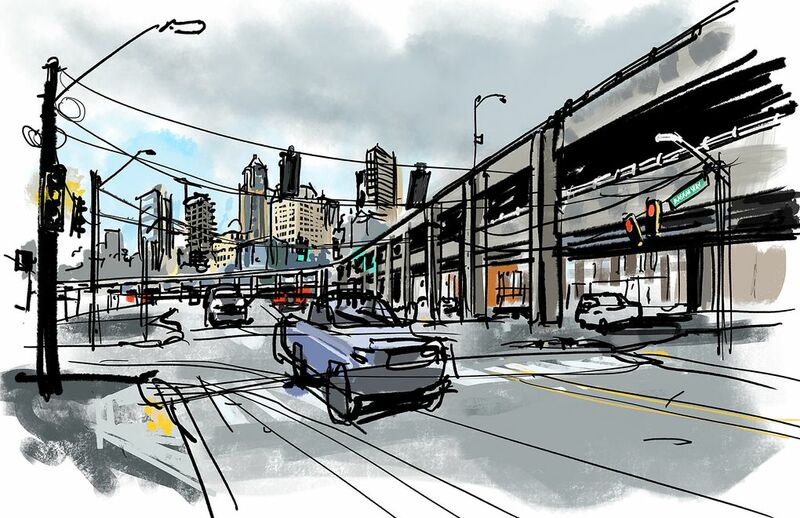 As the new year begins, I don’t look forward to the the “Seattle Squeeze,” the traffic mess the viaduct demolition and other downtown construction projects is supposed to unleash. 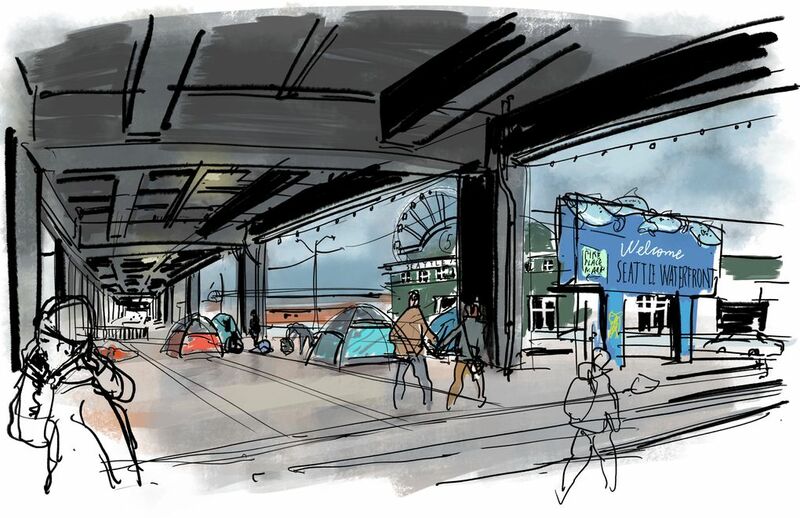 But I look forward to witnessing the transformation of the Seattle waterfront into a nicer place. Just a few inches separate the elevated roadway from a residential building at Bell Street and Western Avenue. A woman walking her furry dog was one of the many people I saw while I made this sketch. Northbound and southbound lanes run side-by-side in this portion of the viaduct crossing Blanchard Street and Elliott Avenue. The Olympic Mountains are glowing in the distance as the sun is starting to go down. It’s a busy afternoon on the Lenora Street Bridge, where I spotted travelers, office workers and runners. This view facing northeast shows the viaduct lanes as they pass over the walkway, an important link between the waterfront and the Belltown neighborhood. It’s hard to watch the state of the homelessness crisis in Seattle these days, let alone sketch it. But I felt I couldn’t ignore the encampment I saw at the entrance of the Pike Street Hill Climb. The Seattle Great Wheel lights did little to brighten this sad scene. Not every square inch of the viaduct is dark and gray. 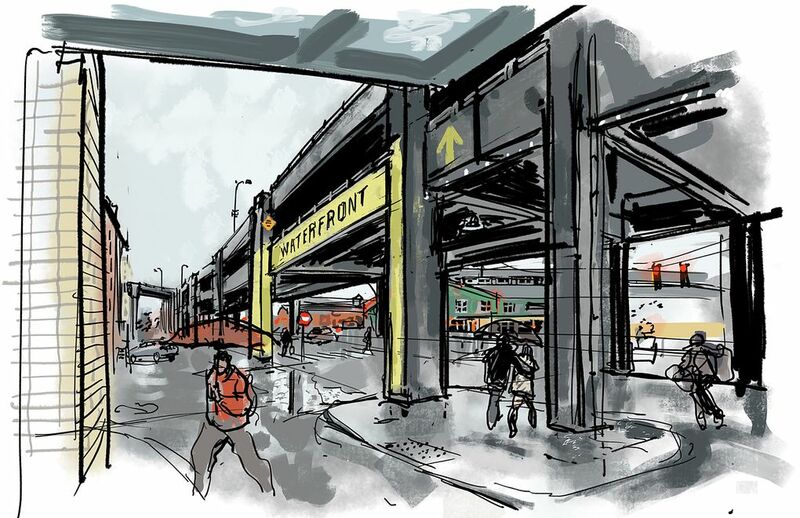 At the foot of University Street, a bright yellow paint job with big capital letters that say “WATERFRONT” and a yellow arrow leave no doubt of what way you need to go to reach the piers. 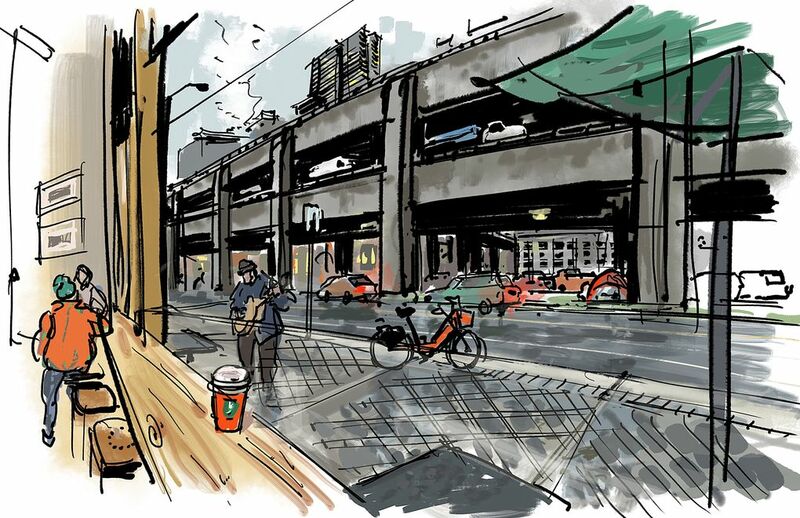 For once, I chose a warm and dry location to sketch and observe the viaduct: a Starbucks on Pier 55 where I hope to return to update this view years from now. 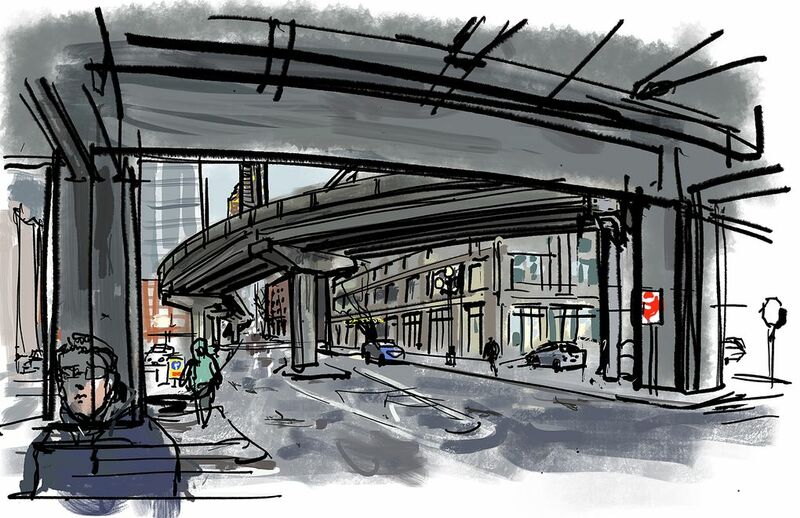 The removal of the viaduct will also free some streets from its overreaching tentacles. 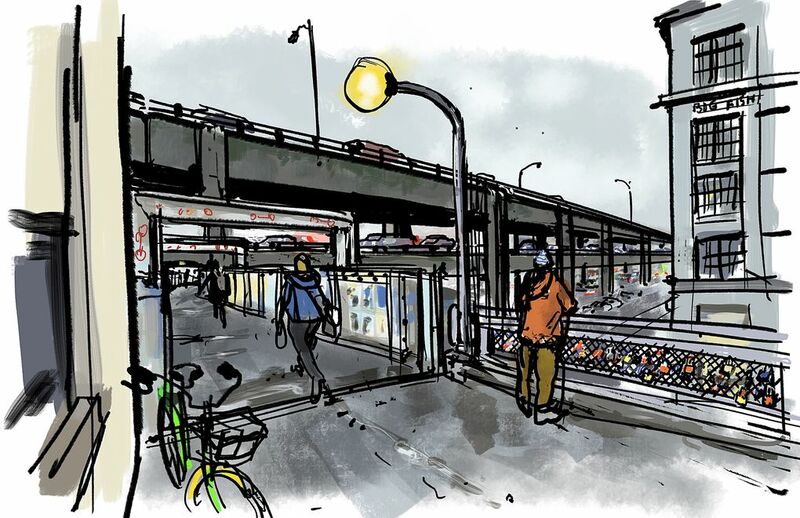 I’m talking about the onramps and offramps at Seneca and Columbia streets. This view of the Columbia Street ramp framed a wedge of sky where I could see the Columbia Center and the Municipal Tower. Here’s a view that ferry commuters know well: the access to Colman Dock via the Marion Street pedestrian Bridge. 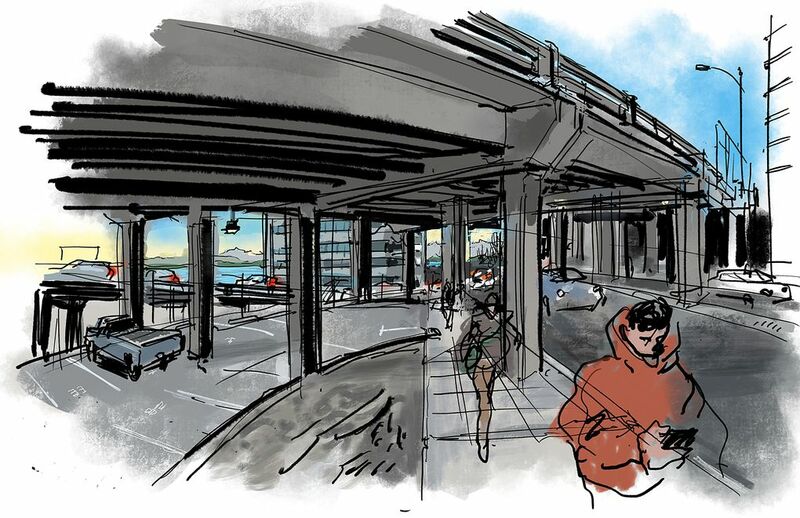 Construction of a new ferry terminal is already under way and it includes plans to rebuild this elevated walkway. Whether the love locks attached to that railing will be preserved is anyone’s guess! 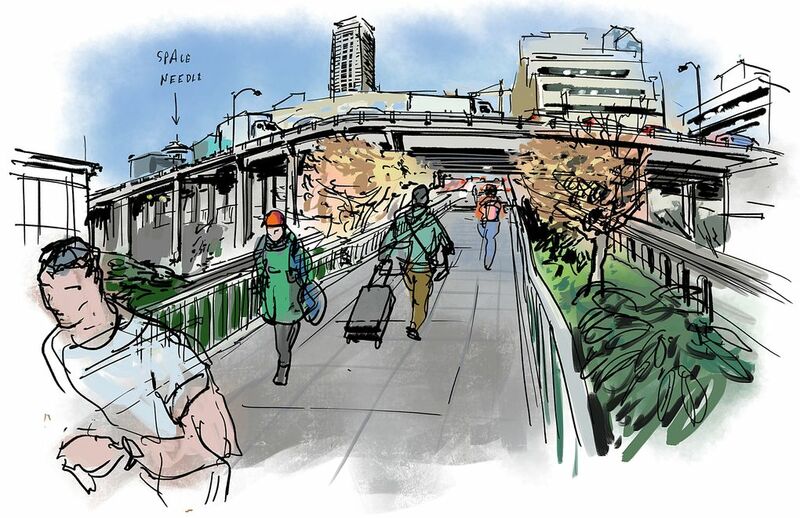 What would Henry Yesler think of the viaduct? That thought crossed my mind while drawing the view from the street that bears his name. This is where the freeway takes a slight turn toward the stadiums and where many of the pillars supporting it were reinforced with metal braces after the 2001 Nisqually earthquake. The sheer size and length of the viaduct is evident from this point near its south end at the intersection of Alaskan Way and South King Street. The succession of concrete pillars holding the double-decker freeway makes it look like a monstrous centipede resting by Seattle’s waterfront. 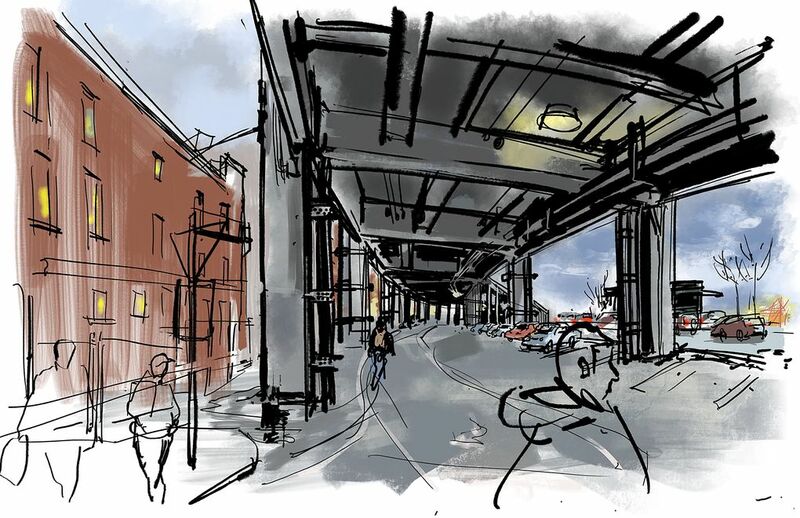 ABOUT THE SKETCHES: Drawn on location using Apple Pencil, iPadPro and the Procreate app. Find behind-the-scenes snapshots on my Facebook page, Instagram and Twitter.